As an English teacher who has worked with James Thurber’s short story in the past, I was even more intrigued. I always thought this lent itself to great stuff — and the 40s version with Danny Kaye was definitely entertaining. The idea of reinventing oneself or escaping and completely starting over is one that is commonly explored in literature and movies alike, and it’s one that I’ve definitely been fascinated with myself. And then I started to read some reviews — each of which essentially crushed it. Bland. Unimaginative. Untrue to Thurber’s vision. But, thankfully, I’ve also been a fan of movies long enough to know that you just simply can’t always trust a movie reviewer — for many reasons. There have been plenty of movies that I have loved that were widely panned — and the opposite scenario is also true. So I held out hope. I can’t say as I really had any definitive plans to see it at a specific time, but when I saw that our local theatre was showing it early today, I decided to go. Early movies typically work best for me, mainly because they’re sparsely attended and there’s a lesser chance of me being annoyed by the behaviors of others during the movie. When I walked in and there were only three others in the theatre, I certainly wasn’t disappointed. Immediately, I could tell that I was in for a ride. 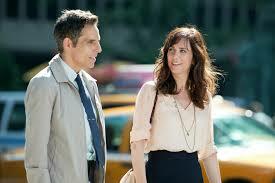 Mitty’s imagination took over within the first five minutes of the movie and I really liked the way in which Stiller, as director, chose to portray Mitty as character. 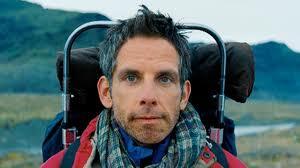 Stiller portrayed him as I saw him — exhausted and needy of something new. Needy probably isn’t a strong enough word — I’d say dependent might work better, actually. He was just in a haze – not only when his imagination ran away with him, but also when he was experiencing “real” life. As I’ve gotten older, I’ve grown to appreciate an actor who is able to convey emotions with his actions rather than his words — and I truly believe that Stiller does this well throughout the movie. 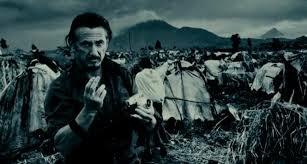 Sean Penn, who plays a barely seen, but critical character, is a master of this, and he doesn’t disappoint in his portrayal of Sean O’Connell, the elusive photographer Mitty seeks. Adam Scott plays the corporate hack whose job it is to come in and shutdown the magazine and he did it well — you just want to punch the guy. Kristen Wiig, however, was the biggest surprise for me — and if you know me at all, you know that I’m not a fan of hers. Wiig, to me, seems to play the same character in everything she does. More importantly, or more annoying, to me, is that she has that same annoying voice that just doesn’t seem like it can possibly be real. It is literally grating to me. (Incidentally, I believe the same thing about Will Arnett, but that’s the subject of a post on its own…) But Wiig was also great — and I couldn’t help but fall in love with her as Mitty did throughout. What impressed me the most about the movie, however, wasn’t the acting or the story itself, but rather the cinematography. Not since I’ve seen “A River Runs Through It,” have I seen something so visually appealing. Whether it was the halls of Life Magazine that looked straight out of 1944 or the Himalayas or Iceland or Greenland, every shot just seemed like the most incredible place on earth. I truly felt like I was there. And I loved every minute of it. So let this be a lesson to you — don’t listen to what others have to say when there’s something you really want to see or do. Don’t allow others to form your own opinions — unless it’s my opinion on a movie, of course, because I’m always spot on (ha!). Oh, by the way, don’t waste a penny on “The Wolf of Wall Street,” either. This entry was posted in just random and tagged Adam Scott, Ben Stiller, James Thurber, Kristen Wiig, Sean Penn, The Secret Life of Walter Mitty. Bookmark the permalink.